Erin Park Lexus is always working to make sure that you are saving money when you visit us. That is why our regularly updated special offers are designed to help you save on everything from new vehicles to quality after-sales services. The team of specialized and experienced advisors from Erin Park Lexus work to make sure that they can answer any questions you might have and to help find the right offer for your situation. 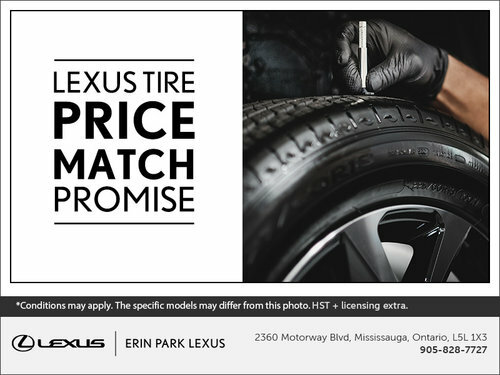 When you come in to Erin Park Lexus for your next vehicle, don’t forget to check out our special offers to see how you can save. Whether you are looking for a new or pre-owned vehicle, you will find a special offer that suits you and helps make your next vehicle more affordable. It’s not just the purchase of your next vehicle that we can help you save on. Our special offers are designed to help you save on our wide range of after-sales services and financing options as well. From detailing to servicing your vehicle, our special offers will help you save. Check out our special offers regularly to see how we can help you save.